Charlotte's Library: Uncle John's Weird Weird World: Who, What, When, and Wow! Uncle John's Weird Weird World: Who, What, When, and Wow! 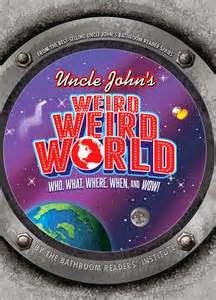 I now know these things, and many more, thanks to Uncle John's Weird Weird World: Who, What, When, and Wow! (Nov., 2014). This is the first volume to come from the Bathroom Readers' Institute (the folks behind the Uncle John's Bathroom Reader) that has pictures! All sorts of interesting, eye-brow raising, and even useful bits of information gathered by Uncle John over the past thirty years are now accompanied by bright illustrations. The result, for us children's book cognoscenti, is something like a Ripley's Believe It or Not book, only with slightly more grown-up oriented content. Not so grown-up, though, as to make it one you'd keep from falling into the hands of the young...but heavy enough so that you would not want it to fall on the heads of the young. Here's what I liked best--reading about Sequoia and his creation of the Cherokee Alphabet. But there were so many, many good little bon mots for the mind--the fact that "meh" first appeared on tv in a Simpson's episode, the fact that the chicken/road joke first appeared in print in 1847, interesting little stories of people being stupid...so many, many things to learn (many of which were trivial, but some actually useful and enlightening). Some are little bites of information, but others pleasingly extended to double pages (like "how the ballpoint pen got rolling"). Give this one to the young teen who loves things like The Darwin Awards, and the aforementioned Ripley's Believe it or Not. Give it to you dentist, or better yet, my dentist, for waiting room entertainment. I myself cannot put this book in my bathroom (no appropriate shelf, and the floor too often has wet towels on it, thanks to the boys), but other people's bathrooms would be good homes for it too.